No where did the article make clear that it is Palestinians who have carried out the deadly stabbings, shootings and ramming attacks. That Palestinians are responsible for the violence which “broke out” is important context in an article which refers to “Israeli army checkpoints [which] often present very physical challenges to commerce.” The Israeli checkpoints are a result of the Palestinian attacks. Unlike their colleagues at Times of Israel, AFP editors failed to act on calls to amend the article to make clear that the violence which “broke out” was Palestinian. This was the first of two AFP articles within the space of one week which whitewashed Palestinian violence. The second article, which also appeared in Times of Israel (“Fatah picks party officials amid talk of Abbas succession“), refers to “the hugely popular Marwan Barghouti, who is serving five life sentences in an Israeli prison.” Nowhere does the article say why Barghouti is serving five life sentences in Israeli prison. Elsewhere, of course, The Times of Israel has reported Barghouti’s role in murderous terror attacks. That the AFP has twice within the last week whitewashed Palestinian terrorism isn’t terribly surprising. 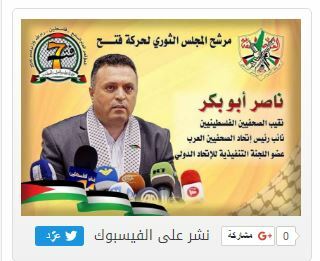 In a gross conflict of interest, AFP’s main West Bank correspondent, Nasser Abu Baker, is the chairman of the Palestinian Journalists’ Syndicate, a position that he has used to lead a boycott of Israeli journalists, endangering them in the West Bank. He was also one of the 1400 delegates to the Seventh Fatah Congress, which wrapped up yesterday, and he even unsuccessfully campaigned for a seat on the Fatah Revolutionary Council. Abu Baker clarified that his intention to present his candidacy and become a member of the Revolutionary Council stems form his keenness to upgrade the Fatah media and the significance of representation of journalists in the leadership of Fatah. While Abu Baker failed in his effort to join the Revolutionary Council, he nevertheless continues to benefit from his association with the receptive AFP, which churns out reports whitewashing Palestinian violence, in favor of the Palestinian national interest. In a sad irony, Israeli media outlets like the Times of Israel, whose reporters are targeted by Abu Baker’s anti-Israel boycott, run AFP’s skewed reports, despite the agency’s gross breach of journalistic ethics in employing a Palestinian political figure.